Satisfy your sweet tooth with a treat that's out of this world. 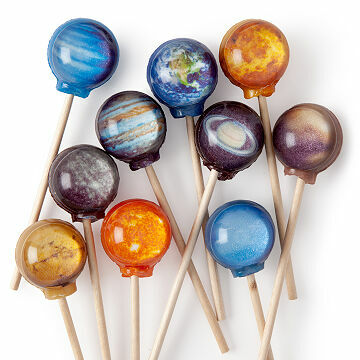 Using a classic candy making process, candy confectioners create the edible works of art in these planetary lollipops. A 2D image is encapsulated in six distinct pops and flavors that are visually out of this world: Each planet gets its own flavor: tropical punch (Mercury), cherry (Venus), cotton candy (Earth), pear (Mars), key lime (Jupiter), guava (Saturn), blackberry (Uranus), mango (Neptune), strawberry/kiwi (Pluto), and marshmallow (Sun). Gift to your favorite science geek or treat yourself to your very own taste of the galaxy. Handmade in Clarendon Hills, Illinois. Lollipops are created using a soy mold and are completely edible. Really cute for planet lovers! These look adorable on one side but unfortunately the design is not 360 degrees and is only on one side of the pop. Also I wish all pops were flavors kids would loveâ€”I think cinnamon and minty/spicy flavors kind of ruin the package since I don't really see someone buying this for non-children....but maybe!! Otherwise they are well made and as described. Haven't tried them yet to test their flavor! Perfect for out of the box thinkers! Giving these to my boyfriend as a Valentine's Day gift. Couldn't find much that wasn't so cookie cut but these are super creative and exactly as described. You literally will get exactly what's is pictured. Unique and fun addition to Christmas stocking! Santa left these in our son's Christmas stocking and her was very excited to have them!! The product was different and MG said it was a cool gift! This can be used by teachers and homeschoolers. Great gift! Uranus tasted the best! It was a gift I've been waiting to give. I saw these several years ago and thought fir sure they would be well received. They were. He said the cotton candy was his favorite. So much like the real stuff he couldn't believe it. Beautiful, afordable, delicious! Got this product for my best friend and she loves them! My grandsons loved the unique flavors and look if these lollipops! Ill probably order them again for a Christmas gift. I purchased this as a gift and it was perfect. The lollipops are so cool and unique! The shipping was also very fast as well. Would definitely recommend to anyone who loves space.